For hibernating animals, life appears to be completely on pause for significant stretches of time. For months, these creatures do not eat, sleep, or defecate. Still, they are aware of their surroundings. These mammals retain activity in their nervous systems during periods of torpor — experiments show that they remain sensitive to stimulation even while hibernating. Hibernation helps animals conserve energy by decreasing the activity of other organs, but the nervous system does not get much of a break. In order for neurons to maintain their functionality, they must also maintain a temperature above that of their surroundings and of the rest of their bodies. Despite its slumber, this hibernating arctic ground squirrel has active thermogenesis going on in the brain. Image courtesy of Polar Trec. Brown adipose tissue (BAT) was conventionally assumed to be the primary supplier of heat in hibernators. BAT is a type of fat tissue that produces body heat in human infants, small rodents, and hibernating mammals. However, recent evidence indicates that neural cells produce their own heat instead of relying on the thermal energy generated by brown adipose cells. A collaboration between the Sviatoslav Bagriantsev and Elena Gracheva laboratories at Yale has resulted in a fascinating discovery: UCP1, a protein found almost exclusively in brown adipose tissue, is also expressed in the neurons of hibernating squirrels. Gracheva, an assistant professor of cellular and molecular physiology, said her lab was one of the first to hypothesize that nervous tissue should be actively generating its own heat in hibernating squirrels. 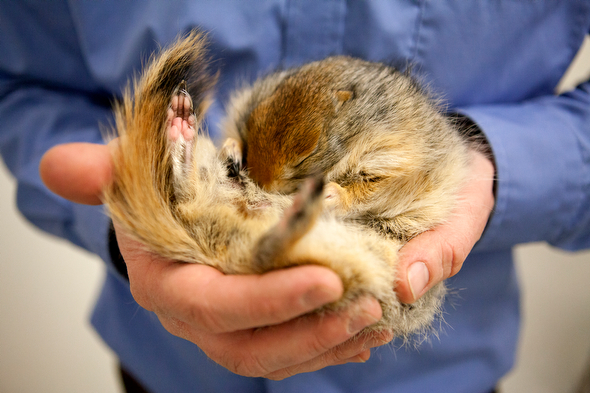 This research not only elucidates how squirrels maintain brain activity during hibernation, but provides answers to essential questions about the process of hibernation itself. Moreover, the researchers believe that the concept of neural thermogenesis, which is relatively new, can be applied to non-hibernating mammals as well. UCP1 and its expression in neurons could improve outcomes for cardiac trauma patients, and it could help us make new leaps in space travel. Uncoupling protein 1 — abbreviated UCP1, and also called thermogenin — is a heat-generating molecule. To produce heat, UCP1 interrupts a pathway in mitochondria called oxidative phosphorylation. In this process, electrons are transferred between donors and acceptors of the negatively charged particles, which releases energy that is then used to transfer protons across the inner mitochondrial membrane. Pumping protons into the inter-membrane space creates a proton gradient. Then, when the system is functioning normally, this gradient drives protons through the enzyme ATP synthase, producing ATP, known as the energy currency of cells. 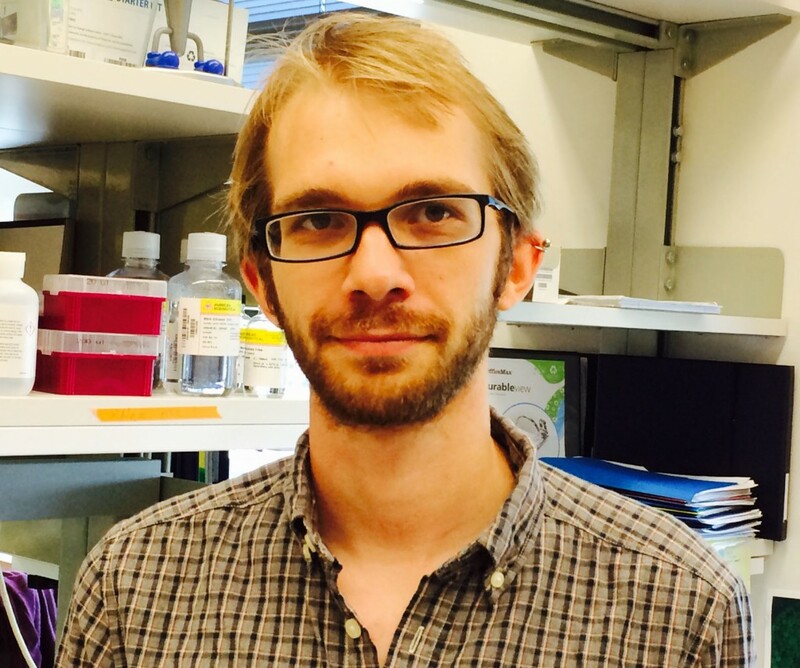 Willem Laursen, a graduate student in the Gracheva lab and lead author of the paper that announced this discovery, explained how UCP1 interrupts normal oxidative phosphorylation. The protein provides an “alternate pathway for protons to travel back down their gradient instead of going through ATP synthase,” he said. By dissipating the proton gradient, UCP1 causes the energy that would otherwise generate ATP to instead produce heat. This is an expected function in brown adipose tissue, where thermogenesis occurs regularly. Scientists have known for years that UCP1 is expressed in substantial quantities in BAT, and that it reroutes protons in mitochondria to spark heat production. But finding active thermogenesis in nervous tissue was astonishing for the Yale team. Although the function of UCP1 aligned with previous findings, its expression in a completely different type of tissue was truly surprising. “The real shocker was the localization of this protein,” Laursen said. In order to identify neuronal UCP1, the researchers compared nervous tissue between hibernating squirrels and active squirrels. More specifically, they looked at gene expression by the animal’s nervous system in both states. 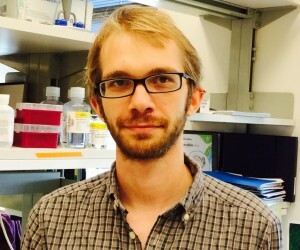 Bagriantsev, an assistant professor of cellular and molecular physiology, explained the rationale behind this methodology: The team looked at RNA transcripts, or molecules that contain the codes for protein expression, because they serve as a proxy for which proteins are active in different cells and tissues. The Yale researchers identified that UCP1 is “significantly upregulated” in the neurons of hibernating squirrels. That is, neurons make more of the thermogenin protein when in a state of hibernation — specific genes coding for UCP1 are active in the nervous system even when the animal seems perfectly at rest. 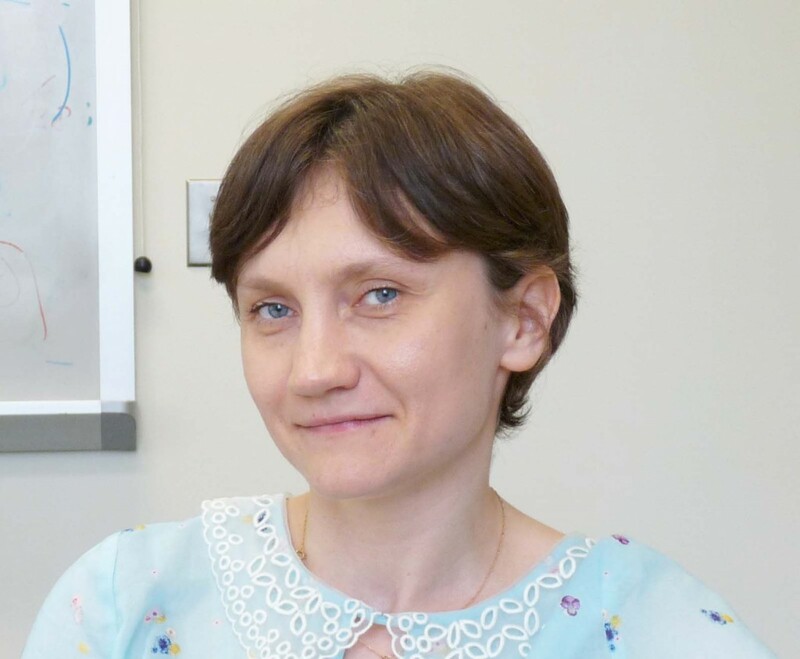 Elena Gracheva is an assistant professor of cellular and molecular physiology at Yale. Image courtesy of Yale Commons. The team also isolated mitochondria from hibernating squirrels to analyze these organelles in comparison to mitochondria extracted from mouse brains. This study revealed that more uncoupling — and more of the associated heat production — occurs in squirrel brains than in mouse brains. Since most species of mice do not hibernate, the researchers interpreted these findings as further support for the idea that UCP1 expression is related to hibernation. According to Laursen, UCP1 is a hot topic in research for several reasons. Not all of us are fascinated by the squirrel species, but many of us will care about the implications of this research on human health and human feats. One example of how UCP1 extends beyond the world of hibernating mammals is the case of therapeutic hypothermia, or the targeted regulation of body temperature. Induced hypothermia has important clinical applications, particularly among patients of cardiac trauma. After an incident of cardiac arrest, the sudden restoration of blood to the nervous system can have adverse effects on brain tissue. Inducing hypothermia appears to suppress neural damage by slowing metabolism and reducing the amount of pressure within the skull. Hypothermia may also play a pivotal role in preventing the harmful cascade of reactions that results from oxygen deprivation during a cardiac event. There are currently limitations to therapeutic hypothermia: Namely, the human body cannot attain the same low temperatures of other mammals, such as squirrels, without harmful side effects. “By understanding how to induce the expression of UCP1, we can potentially apply it to some hypothermic conditions in medicine,” Gracheva said. UCP1 could be the key to balance between hot and cold — we could induce hypothermia in a certain system while in other body systems preserving the heat that humans need. Willem Laursen is a graduate student in Neuroscience at Yale. Image courtesy of Yale Commons. UCP1 in humans is highly similar to the protein found in ground squirrels, which has been the main focus of Gracheva, Laursen, and Bagrianstev’s research. “Even though mice and humans don’t hibernate, that doesn’t mean they cannot be, in principle, put into hibernation,” Bagriantsev said, explaining why this homology of proteins is relevant. Research on neural thermogenesis in dormant animals advances our understanding of hibernation, getting us one step closer to the possibility of inducing it in non-hibernating species. When would we ever want to induce a hibernation-like state? Perhaps for purposes of space travel. By initiating a dormant state in astronauts on a journey to Mars, eating and drinking would be temporarily nonessential, conserving resources. Moreover, these individuals would function normally when aroused. Of course hibernation is a complex process, and triggering it in humans is beyond the capacity of modern science. The expression of UCP1 in nerve cells, however, reminds us that induced hibernation may be feasible with ongoing research. UCP1 is upregulated during hibernation but is not present in neurons when squirrels are active, suggesting that this protein can be turned on and off. How the body induces and turns off the expression of UCP1 is a potential direction for future research. Before groups at Bagriantsev’s and Gracheva’s labs found UCP1 in the neural tissue of squirrels, the concept of local thermogenesis was only beginning to circulate through the scientific community. The only similar finding, Gracheva said, was the discovery that common carp express UCP1 in the brain to protect against nervous tissue damage while swimming through frigid waters. Gracheva believes the recent work from her lab is indicative of the similarity between the molecular mechanisms used in ground squirrels and common carp in warding off the cold. The role of neural thermogenesis in maintaining brain temperature is just recently gaining attention, but it has many potential applications in medicine and technology. In the future, UCP1 may be a critical component for processes as chilling as inducing human hibernation, and as triumphant as sending humans safely to Mars. About the Author: Emma Healy is a freshman in Ezra Stiles college. She is a prospective molecular, cellular and developmental biology major from New Hampshire. Further Reading: Laursen, Willem J. et al. “Neuronal UCP1 expression suggests a mechanism for local thermogenesis during hibernation.” Proceedings of the National Academy of Sciences 112, no. 5 (2015): 1607–1612. Acknowledgements: The author would like to thank Dr. Bagriantsev, Dr. Gracheva, and Mr. Laursen for taking the time to talk about their research.